How does our air cooler work? How does our mini split work? Pioneers in the use of solar energy. Without paying for the high costs of air conditioning energy. Are you tired of high electric bills during heat waves? Do you want to keep a room, residence, office or warehouse fresh and refrigerated but fear those high electric bills? This doesn’t need to be a problem anymore! It’s a thing of the past! Did you know there are several alternatives for low-cost cooling systems without using conventional electric currents? 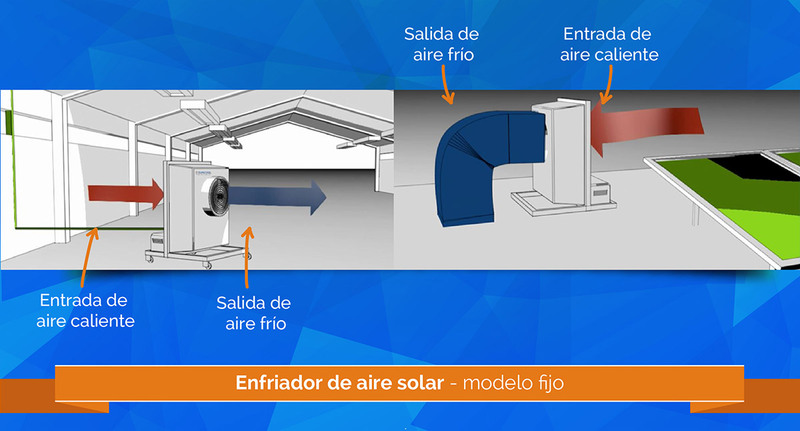 In Suncool Air Mexico we provide the alternatives that you need and will fix your cooling problems and above all… will help you save a lot of money! We'd like to offer you a different and innovative solution at a low cost. Suncool Air Mexico we are a company that began to operate in 2015 in northern Mexico, in the cities of Tijuana and Mexicali and emerged from the need to add to the market new cooling, refrigerating and ventilation technologies using renewable energy sources in a more effective, smarter and friendlier to the environment way and for it to be profitable. Even though our company Suncool Air Mexico was established recently, we have over a decade of experience in the Mexican and North American solar energy industry. In Suncool Air Mexico, we are part of the international conglomerate Sustainable Development International which has been in the Mexican and American markets for almost a decade in the solar energy industry, designing and building photovoltaic generators for the housing, commercial, industrial, agricultural and special application sectors through the construction company GeckoLogic Energia Solar based in the sunny city of Tijuana, Baja California, Mexico and San Diego Solar Broker which offers their innovative business strategies to all of their clients in Southern California, U.S.
Suncool Air is one of the 40 most innovative companies in Mexico for Solar Air Conditioning Technology. Suncool Air has been the Award Winning company for the hotel chain City Express on sustainable innovation for its Air Conditioning technology. 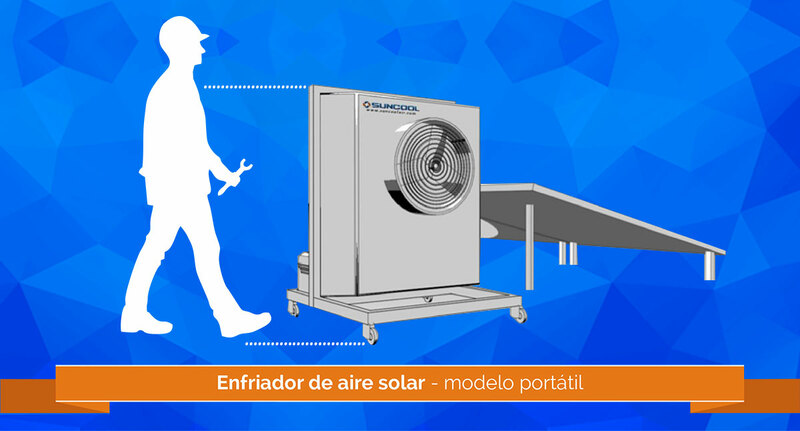 Suncool Air has won the Banamex Award to the Company with the Greatest Social Impact with his solar air conditioner mini split. These awards set us apart for being one the most innovative companies in Mexico and by being committed to environmental conservation and social impacts. What is our solar air cooler? 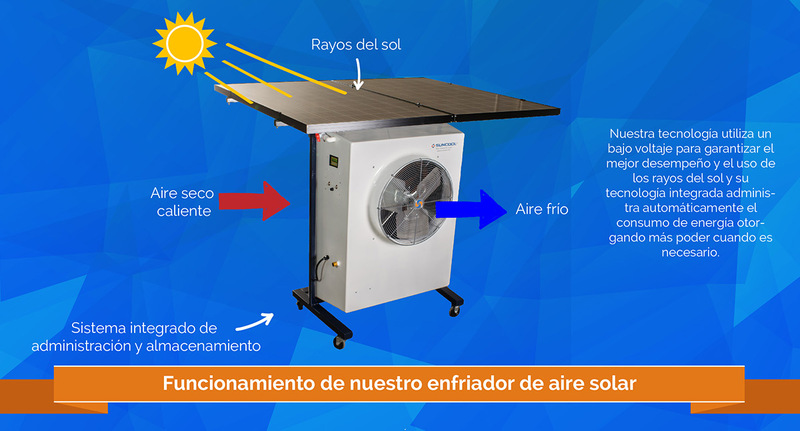 It’s a product created by the engineers of Suncool Air Mexico, unique in its class which allows it to cool interior and exterior rooms... And the best part is that it doesn't use any electric energy! Because it works through solar panels and water flow. How does our solar air cooler work? Our solar air cooler lowers a room’s air temperature using water flow and solar energy. It works by the very same evaporative cooling principle where dry and warm air from outside is collected in our unit, pushing it inside with a turbine and going through a wet permeable layer. Air collected cools when meeting the permeable layer, this leads to water evaporation, which produces a drop in dry air temperature and achieves cooler air volume. Our solar air cooler doesn’t connect to conventional electricity; it works through a solar panel or module operating at low voltage and it generates the necessary energy to make the system fully work. Can the solar air cooler work anywhere? The answer is Yes! Our solar air cooler is specifically designed to work anywhere, even in rural areas without access to conventional electric grids, as well as industrialized zones. It can be used in interiors (offices, warehouses, industrial ships) or exteriors (fields, events, agricultural, beaches, mines). If you’re wondering if it’s hard to install, the answer is no! 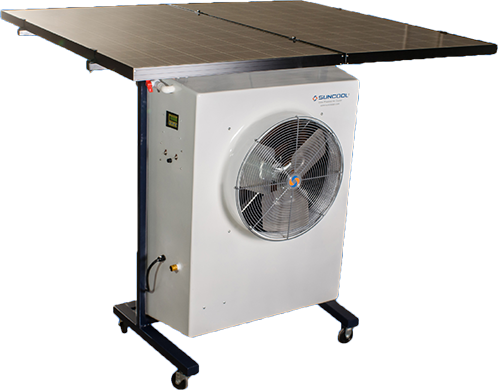 Our solar air cooler is fitted with an array of photovoltaic solar modules, which can stay mounted on top of the unit making it 100% mobile or dismounted and be placed over any temporary surface while the unit keeps receiving energy generated through an extension cable made specifically for these types of applications. This model can be mounted within any covering without receiving direct sunlight and/or be coupled with any other type of air duct. You’ll have improved air displacement efficiency. (5,000 feet ³/min). Unlike other conventional systems, our solar air cooler will achieve cooling a larger sized area, in less time while also eliminating high electric bills. You’ll be done with high electric costs! Our solar air cooler works with 100% solar energy which will help you lower your operating costs! You’ll be able to keep your room refrigerated for longer periods of time without needing to worry about high electric costs. You’ll be able to deduct this equipment acquisition. Since our product contributes to the environment, it’s eligible for tax incentives in the United States as well as Mexico. You’ll be contributing to environmental conservation. Our model uses no CFC gas coolants, which contribute to the deterioration of the ozone layer. On the contrary, it works with water and solar energy, which doesn't contribute to environmental contamination. 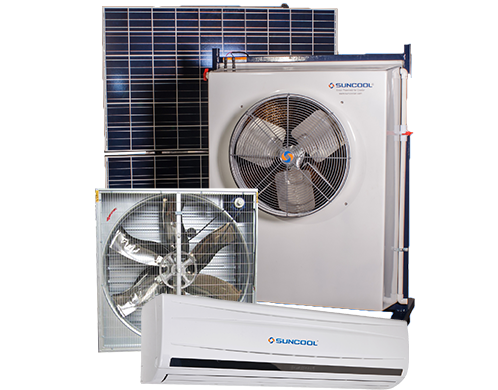 You have the option of acquiring and financing your solar air cooler through federal government grants and programs. By using technology that functions with renewable energy, our products are candidates for governmental economic grants and subsidies. You can use your solar air cooler anywhere. Even in rural areas where there is no access to conventional electricity or areas with a warm or cold climate. Don’t hesitate any longer and enjoy the benefits that your solar air cooler can bring you! You’ll see a return in your investment very shortly and you’ll notice the savings in your operating costs in an instant. Buy the solar air conditioner Now! What is our solar mini split air conditioner? It’s a solar refrigeration system with a unique technology in the marketplace. Our model is like a conventional mini split, the difference being that it uses solar energy to work through solar panels. How does our solar mini split air conditioner work? It works under the same air conditioning or refrigeration principles with compression (insert link to explain air conditioning) where four parts are used: an evaporator, a condenser, an expansion valve and a compressor. The difference with our model and a conventional one is that our solar mini split air conditioner works with a conventional electric grid and solar panels at the same time; using solar energy during peak hours of sunlight and a conventional electric grid during the rest, reducing high electric bills up to 90% during sunlight hours. It offers excellent energy efficiency during those sunny and warm days, our variable velocity compressor and inverter technology lowers electric current consumption while solar panels fuels the unit, thereby lowering or completely eliminating tension that otherwise would be generated by a conventional electric grid. What is the main advantage of our solar mini split air conditioner? One of the main benefits is that it will save you a lot of money, that 90% of it functions with solar energy during sunlight hours, that it is an easy and affordable installation and it will create a quick return in your investment. Also, it's so easy to install our model that you can do it yourself and save on installation costs! 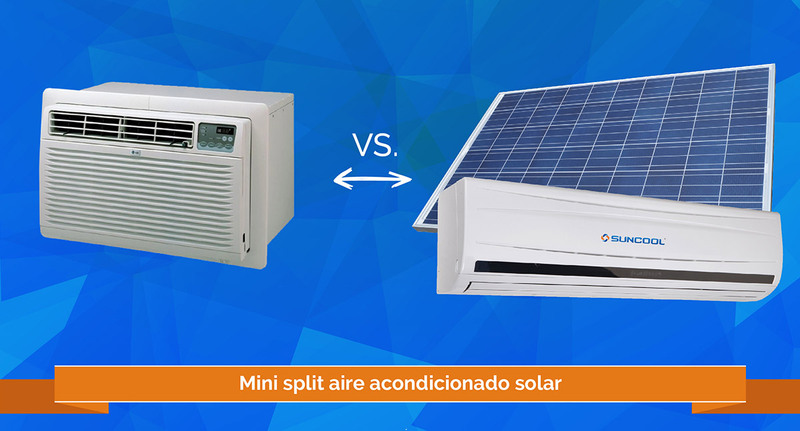 Our solar mini split air conditioner is installed the same way as a normal mini split air conditioner, the solar panels connect with MC4 standard connectors. You can use 1, 2, or 3 solar panels with a 900-watt limit. Our solar mini split air conditioner uses R410a, a coolant that won’t harm the ozone layer, this makes our equipment the best option in the marketplace for companies and users with responsibilities towards the environment. No high electric bills and no more sweltering hot days! You’ll be able to enjoy a cool and pleasant environment with our solar mini split air conditioner at a low cost.